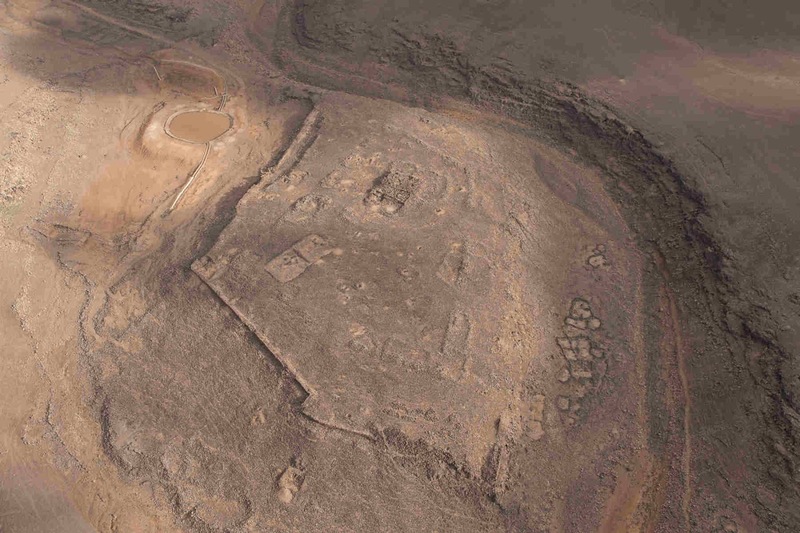 Bronze Age city of Jawa. © APAAME_20130409_DLK-0022. Our first flying day of the 2013 season started well, with the No 8 Squadron Hueys back in action. 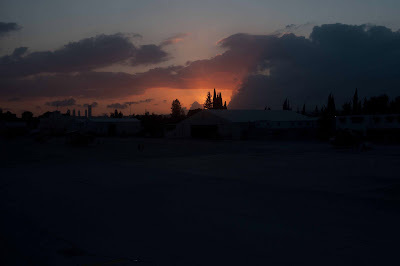 We began our day with take off at 0710, headed east and successfully located the ancient (Bronze Age) city of Jawa, to record some recent activity there. 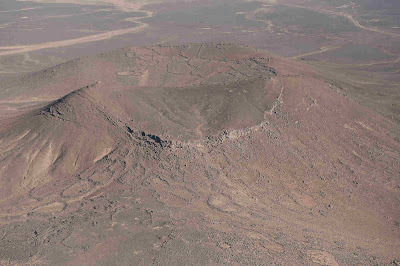 Then it was on to a number of stunning locations in the black basalt desert. However the story of the day was not what we achieved in the air, but what we didn’t achieve, as we were grounded for so long. 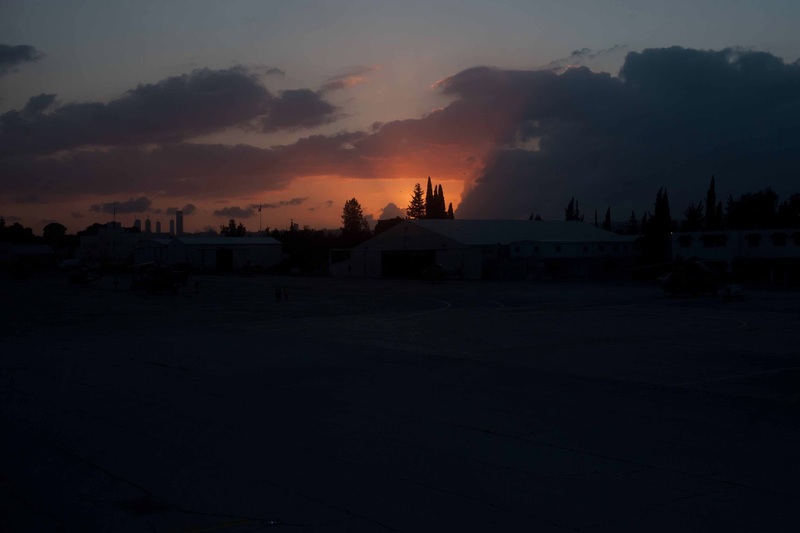 Flying in the far east of the country requires re-fuelling at Ruweishid airbase, where the RJAF arrange for a fuel bowser to be there for us. 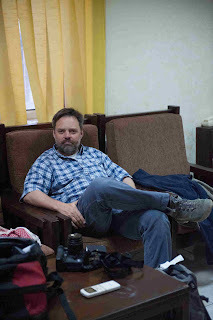 Dr Bernd Mueller-Neuhof relaxing before the day's flying. After the first two-hour flight we re-fuelled without incident, and had another great flight recording a landscape of prehistoric flint mines. 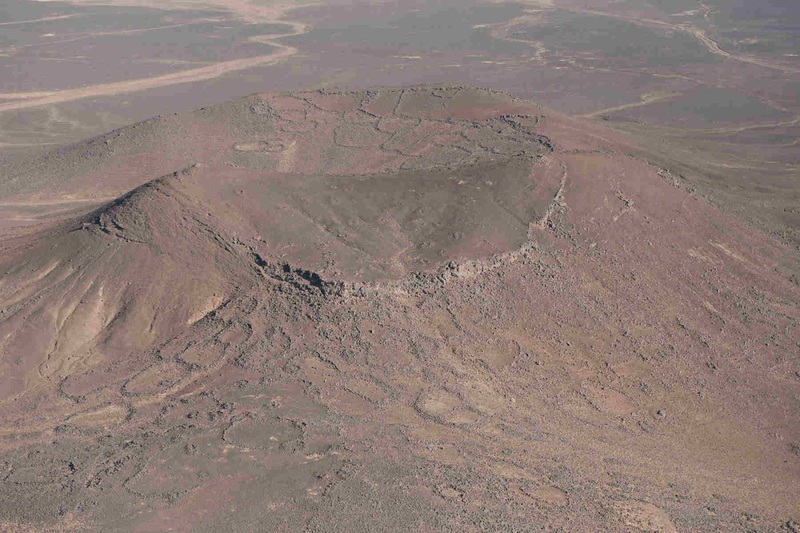 We were accompanied by Dr Bernd Müller-Neuhof, who has been surveying these on the ground. He pointed out the mines' exact locations– very useful as the outcrops looked rather geological to our untrained eyes. They are in fact one (of only two) very important sources of flint in the 4th millennium BC for the entire region. 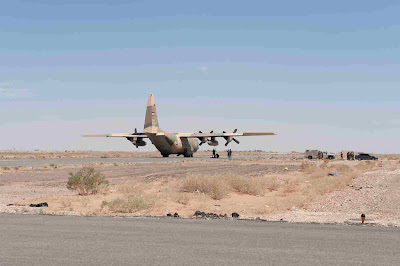 On our return to Ruweishid to re-fuel again, a transport plane was on the runway (a C130, or Hercules). On disembarking there was more than the usual greeting party - how many people does it take to re-fuel an aircraft? On the first re-fuelling I counted 9; by now there was a dozen or more. 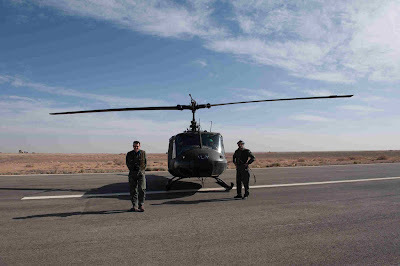 There was animated discussion, all in Arabic, slightly away from the Huey, so I knew that something had changed. I wandered off to find a toilet and on returning found that the ‘animated party’ had departed, along with the pilot and David Kennedy. We were taken to the base commander’s office, where the animated party’s discussion continued. Coffee (strong local brew) and then some tea was served. Eventually it was explained to us that “our” bowser had taken on some contaminated fuel. The C-130 had been going to re-fuel (using “our” bowser) but to do so the bowser would have had to take on more fuel; this was available in a storage tank (which it transpired had not been used before), and the transfer began. However, upon inspection before re-fuelling the C-130 they discovered it was contaminated and so no one could use it. So, what to do? Two aircraft: one (ours – the Huey) without enough fuel to take us anywhere, the other (the C130) with enough fuel to go anywhere, and a bowser with plenty of (contaminated) fuel. 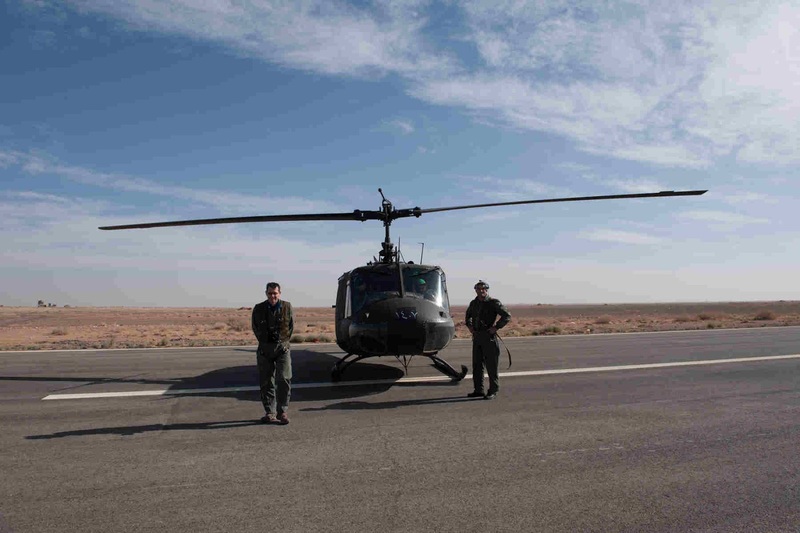 Many phone calls were made and option appraised, which resulted in the proposal to siphon fuel from the C-130 into jerrycans, and then transfer this fuel to the Huey. So, how long does it take to siphon 700lbs of fuel from one aircraft to the other? A long time. Each jerrycan held 25lbs, and we needed 700lbs for a safe flight to Safawi (the nearest airbase with fuel). It transpired after about 2 hours of waiting (so, by this time c 1300 hrs) that each can was taking 15 minutes to fill. So 30 minutes per 100lbs, and we needed c 700lbs = 3.5 hours. Lunch of rice and chicken was served – very welcome and enjoyable, even if (in the co-pilot’s own words) the chicken was ‘well done’. Hospitality is number one in Jordan – equal (on this day) to our safety. 'Ghussein Settlement 2'. © APAAME_20130409_DLK-0041. We continued to discuss our options. As the afternoon wore on the light was becoming better and better and there was one site in particular – Khirbet Abu al-Husayn – we wanted to photograph with Bernd. He and his team had discovered it in a field survey and no-one has yet photographed it from the air. 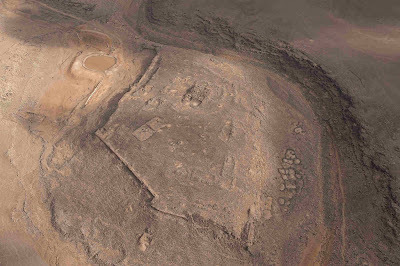 It is not dissimilar to the site ‘Ghusein Settlement 2’ shown here. You can see why we were keen to get going! Bob Bewley and Pilot with a Huey from No. 8 Squadron. Our hopes for photography raised by this scramble to get going were dashed when we saw that the re-fuelling was still ongoing and the pilot wanted three more cans to be loaded. Quick re-calculation: hmmmm…won’t be airborne till 1630 and there’s a 20kt headwind. Might be dark when we get to Amman, even if we forget the idea of any further photography. We filled this last hour with some ridiculous jokes and the differences between English and German humour. Bernd now knows a suite of “Knock, knock jokes”… none of which warrant repetition. So, at 1650 (what’s another 20 minutes when you have waited 5 hours already?) we were strapped in ready to go; we lifted off at 1700 and arrived at Safawi 40 minutes later. A quick re-fuel and off; but remember hospitality is number one (as is safety), so we had ka’hawa (a welcome coffee) and then tea with the station commander. He seemed genuinely interested and we give him the website address for our photos and he gives us his card – a Brigadier-General! We don’t meet many of those, so we are glad to have accepted his hospitality. We started to ask ourselves 'what time does the sun set'? Final leg: took off at 1815 and landed at Amman, safely, with the sun setting, at 1900. Officially the sun set at 1901. I have been wondering about suggesting we do an afternoon flight, as we normally operate in the morning. At this time of year, there is scope for more, but circumstances today prevented from us taking full advantage. Sunset over Amman at the end of the day.